Makes 12 enchiladas, which serves 4 as a main dish. 1. Warm the enchilada sauce in a small saucepan with the lid askew, over medium-low heat until piping hot. 2. Warm the 2 tablespoons of cooking oil in a large saute pan over medium heat and add the onions. Saute until soft, about 5 minutes. 3. Add the shredded turkey meat to the pan and toss with the onions to warm through and combine flavors. Add about a Tablespoon of turkey broth, vegetable broth or water to the pan to keep everything juicy, and season with salt and pepper to taste. 4. In a small, shallow pan (like a small skillet or omelette pan), warm the flavorless oil over medium-high heat. The oil should have a depth of about 1/2-inch to 1-inch. 5. Test the oil for heat: when you dip the edge of a tortilla in the oil, it should sizzle and produce gentle (not furious) bubbles, and the oil should not smoke. First: Use tongs to briefly place each tortilla in the hot oil, carefully flip it once, and remove it to a plate. The tortillas should soften in the oil, but should not become at all crisp. Second: Spoon some of the shredded turkey/onion mixture into the center of the tortilla. Shredded turkey spooned into the tortilla. Third: Ladle a small amount of warm enchilada sauce over the turkey. Ladling sauce over the turkey. Fourth: Roll up the tortilla with the turkey and sauce inside, and place it against one end of the casserole, edge down so that it stays rolled. 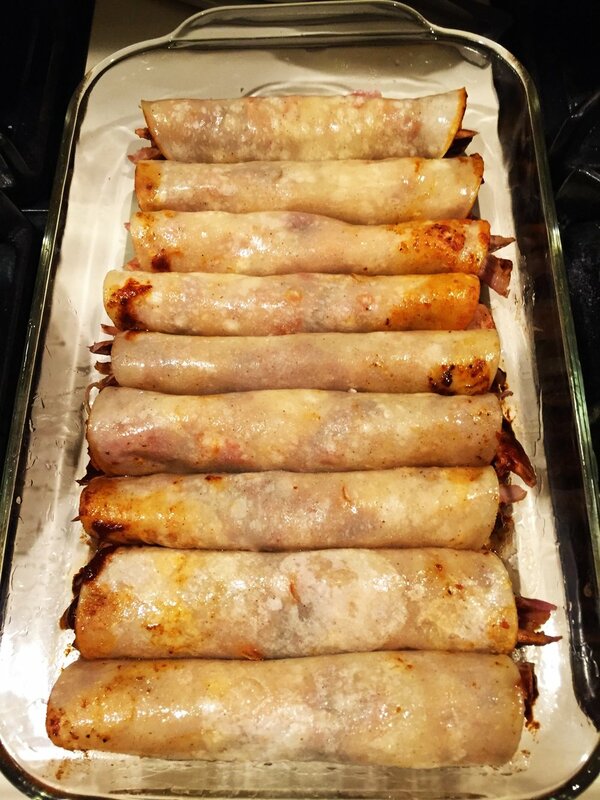 Enchiladas, all rolled up and ready for sauce and cheese. Fifth: Repeat with the rest of the tortillas. 7. When all the tortillas have been rolled and are in the casserole dish, ladle the rest of the enchilada sauce over the enchiladas. Spread the cheese over the top. 8. Bake for about 10 minutes, until everything is bubbling-hot. (If you are using Queso Blanco or Queso Fresco, note that they won't melt like the other cheeses.) Serve hot. Serve with Mexican-style beans or refried beans, or a salad. Read the tortilla label carefully to be sure they don't have any flour in them. They won't work right for this dish if they do. Corn tortillas are naturally gluten-free as long as they are made in a GF facility (read the package), and made the traditional way (without flour). Same for enchilada sauce - it's not made with any gluten-containing ingredients, but read the label if you're using canned sauce.